The breed originated in Tibet but developed into the breed it is today in Hungary. The name originally came from the Turkish word "kawasz" which means "armed guard of the nobility." They were the companions of the Hungarian rulers and other European empires. Only royalty could own them. 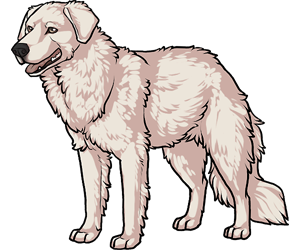 A couple hundred years later, the breed was found to work with sheep and cattle well and became livestock guard dogs. They became the "commoners" pet. Kuvasz is impervious to pain, especially in the neck and chest.